Five years after escaping a suicidal cult, a young woman remains haunted by a ritual intended to bring a demon to Earth. Gloria Farrow wakes from a nightmare during which she flashes back to five years earlier, when she escaped a group of cultists who ritualistically slit their own throats while she was restrained to a sacrificial altar. Gloria attends a group therapy session with her girlfriend Joan, who was supposedly whipped by her father growing up, before the two young women spend time serving food in a shelter with fellow volunteer Kent. In bed together later, Gloria and Joan reflect on the respective traumas that led them to each other. Joan gifts Gloria with a necklace to commemorate their upcoming anniversary and they say their goodbyes. While walking home alone, Gloria is abducted by former cultist Thomas, who chains Gloria inside his RV and takes her to a remote family cabin in the woods. On the way, Gloria briefly recovers her cellphone and leaves a frantic message for her mother Ruth. While chained in the cabin, Gloria dreams of waking from the ritual covered in the blood of cultists lying dead around the altar. Thomas promises Gloria that he intends to save her. Joan calls Ruth looking for Gloria, which leads to Ruth’s discovery of Gloria’s voicemail. When Officer Carter claims there is little the police can do, Joan organizes her own search with Kent and other volunteers from the church. Thomas explains to Gloria that he was part of the cult from five years ago, but seeing her face that night convinced him that the cult was delusional. Thomas faked his death during the ceremony because he no longer believed the cult’s purpose. Thomas and Gloria both begin having visions of the cult and a demon haunting them. Thomas tells Gloria that her ordeal will be over provided he protects her until sunrise. While going door to door searching for Gloria, Joan puts her knife to the throat of a man who refuses to look at Joan’s flyer. Ruth later calls Joan to her house after Officer Carter asks to question Joan about the necklace found at the abduction site and about Joan threatening the uncooperative man. Joan murders both Officer Carter and Ruth. Thomas tells Gloria that five years ago, the cult intended to receive their dark lord Abaddon by the light of the locust moon so that he could be reborn under the same locust moon five years later. Thomas explains that not all of the cult members died, and by sacrificing Gloria, Abaddon can be brought to this world. Joan is revealed as a cultist when she is seen flogging herself in front of a shrine to Abaddon as punishment for losing Gloria. Thomas realizes there may be truth to the cult’s beliefs when he sees Gloria transforming and growing holes in her shoulders. Haunting visions continue as Thomas is seemingly seduced by Gloria only for her to morph into a demon and vanish. Kent introduces Joan to Mr. Vela, who provides a tip that he saw a suspicious RV around the time of Gloria’s abduction. Gloria has Kent come with her as she begins tracking Thomas’ trail. Thomas reveals to Gloria that Joan is actually his sister Gwen who hid under their mother’s name. Joan/Gwen was the cult’s ‘Chosen One,’ the lone survivor who would complete the ritual after five years. Thomas also reveals that it was his sister who gave him the burn scars on his face. A demon seemingly appears and Gloria escapes the cabin before regrouping with Thomas in the woods. Thomas returns Gloria to the cabin as her metamorphosis continues. Joan and Kent finally locate Thomas’ RV. Joan kills Kent. Realizing that the demon has already taken her, Thomas prepares to shoot Gloria, but is thwarted by a vision of his burning by Joan and the cult. Thomas crawls outside and Joan captures him. Joan confronts Gloria. Visions of cultists appear around a pentagram surrounding Gloria as Joan clutches a knife and recites an incantation. Thomas escapes captivity and breaks into the cabin with an ax. As he crashes through the door, Thomas ends up in a vision of an open field where Gloria greets him. Thomas breaks free of the illusion and puts his ax into Joan’s back in reality. Visions continue slowing Thomas down. As Abaddon appears, Thomas kills Joan with a shovel and the illusions vanish. Thomas rescues Gloria as she is seemingly dying and he brings her outside to see the sunrise like he promised. However, Gloria suddenly attacks Thomas and sprouts wings from her back. Canada-based Black Fawn Films and director Chad Archibald have steadily assembled a mostly solid slate of indie horror features whose hooks are highlighted by production values on par with some mainstream releases, undiscovered actors with actual ability matching photogenic appeal, and outstanding subgenre diversity delivering a different experience with each entry. Prominent productions include supernatural serial killer thriller “The Drownsman” (review here) and post-apocalyptic social media chiller “Antisocial” (review here). Although individual releases have met with varying levels of approval, even disapproval, from my personal tastes, at a minimum I appreciate that the company isn’t content to repeat themselves and continues trying to freshen up another formula on each go. “The Heretics” doesn’t have the drive-in delirium of Black Fawn’s batty “Bed of the Dead” (review here). It also isn’t as viscerally nasty as Archibald’s body horror shocker “Bite” (review here). Cinematic storytelling is nevertheless pulled off quite competently. There is just a conflict in wanting to commend everyone for not biting off more than they can chew tempered with the notion that abstaining from innovation this time around leaves the end product a semi-straightforward demonic possession fright flick. Gloria Farrow is still haunted by the nightmare ordeal of escaping a horrific occult ceremony. Five years ago under the light of a locust moon, cultists in white robes and wood/bone masks ritualistically cut their own throats, bathing Gloria in their blood while she screamed on a sacrificial altar. The recovery road has been long, though Gloria has had her girlfriend Joan, an abuse survivor herself, along with her mother Ruth at her side for support. Even in death, the cult is far from finished with Gloria. It turns out the previous ritual was only phase one of a more insidious plan. A new locust moon now approaches. With it comes the cult’s unexpected return, as well as the unholy promise of their devilish dark lord Abaddon being reborn through Gloria. Aspects of “The Heretics” often take from the same places where they give. Luckily it isn’t in an exactly equal ratio, so hits outnumber misses in the final tally. For instance, Jorja Cadence bats a home run as Gloria’s girlfriend Joan. Her mix of Emma Stone charmer and Lindsay Lohan vixen creates a convincingly complex character drawing you in through drama. On the other side of the aisle, Black Fawn familiar face Ry Barrett bugs his eyes out so often to sell the consternation of a conflicted cult member, you wonder if he even has eyelids. I’m being glib of course. But there is an imbalance in the acting and some of that stems from fluctuations in how much meat the script offers everyone to eat. An early scene of Joan challenging Gloria to choose between experiencing the trauma that brought them together or avoiding it altogether under penalty of not falling in love captures a compelling angle on their relationship. Other dialogue is less intriguing, often motivated purely by progressing the plot through basic exposition. Inconsistencies in these aspects are tied together by evilly eerie cinematography and well-designed sound using style to counteract coming up short on ambition. For B-movies on a budget, Black Fawn consistently constructs their projects to make scope seem grander than it is. “The Heretics” is another effort designed to be confined to a core cast, small crew, and intimate setting. Yet there are enough ancillary characters and open exterior scenes to prop up an appearance of being a bigger production. Genuinely creative work is in play to increase the film’s footprint in spite of inherent limitations. 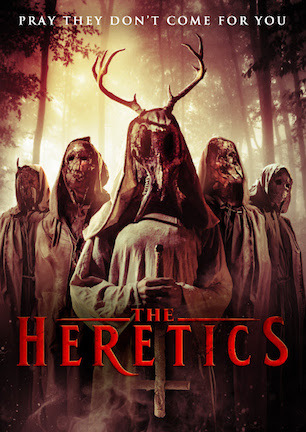 Overall, “The Heretics” is a satisfying, if ultimately adequate, horror movie featuring cults, crazies, and a cabin in the woods. Even though it isn’t a standout in Black Fawn and Chad Archibald’s complete catalog, it isn’t a weak film on its own merit. Acts two and three could merely use more snap and more scares to avoid scraping feet when they don’t lift their legs high enough to maintain a tight pace. March 30, 2017 by Ian Sedensky.